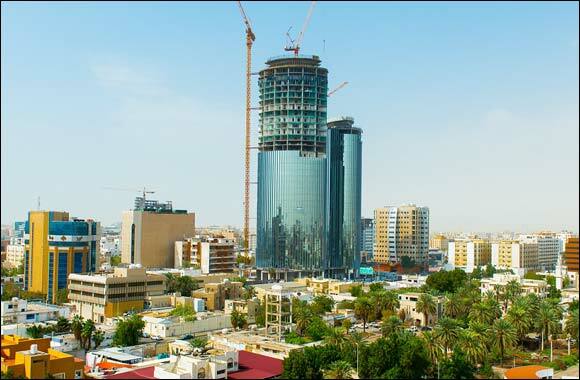 Jeddah: Sloanes Real Estate Brokers, a subsidiary of the SABBAN Group of Companies, has announced the completion of Bayat Plaza’s sample floor, and will soon be transforming the skyline of central Jeddah with its luxurious residential development and contemporary landmark. Strategically located in the business hub of the city, Bayat Plaza will provide a unique concept in the heart of Jeddah, combining residential, retail and leisure amenities all at one location on Madina Road. Bayat Plaza is built up over 32 stories and serviced by over 2,600 square meters of retail space on the ground and first floor. Bayat Plaza is by far the tallest development in the area and can be seen for miles on approach from any direction. Its illuminated glass crowns at the top of the buildings stand 180 meters above the ground and will shortly become a beacon of quality and progress in Jeddah. Built with a sleek external architecture, Bayat Plaza will compromise of a considerable mixture of apartment types in the towers with over 266 stylish and contemporary two-bedroom apartments, three and four-bedroom Sky Villas and five-bedroom penthouses. Each unit is delivered fully equipped with kitchen appliances, built-in wardrobes and superior fixtures and fittings. Bayat Plaza TOWER ONE is made up of 176 two-bedroom apartments, spread over 24 floors, with each floor accommodating eight apartments of two differing types looking out over the skyline of Jeddah. Bayat Plaza TOWER TWO contains 56 three-bedroom and 28 four-bedroom spacious Sky Villas spread over 34 floors. The Sky Villa is designed for those wishing to take advantage of ‘villa-style’ living, but maintain the exclusivity and privacy of living in a landmark tower building. Each Sky Villas spans two floors and boasts a living room as well as a majlis room for guests to enjoy. Bayat Plaza has a multitude of lounges and rooms on the amenity level including; male and female family lounges, a fully equipped games room, business lounges, a reading room, multi-purpose rooms and male and female toilets. At the ground level, Bayat Plaza’s curving exterior houses Bayat Boulevard, a boutique shopping mall that will offer residents and visitors a host of new luxury shops, exclusive caf�s, cutting edge restaurants and niche grocery stores; all of which are hand selected to add value to the property. The twin towers are joined by a fully equipped state of the art gymnasium which has panoramic views over Jeddah’s skyline. Children are well catered for with a purpose-built children’s playroom, adjoined to the garden lobby, where residents can step out to the Bayat Sky Gardens. Bayat Plaza is currently 90% complete and on schedule for handing over to investors by December 2017. Prices for apartments start from SAR 1,200,000 for apartments and from SAR 3,000,000 for Sky Villas.